Mixed mode studies in survey research have been around since a long time. Whenever a new mode of data collection emerges, it has been combined with existing traditional modes of data collection, and compared in terms of resulting response rates, response bias, data quality and measurement error (Couper 2011, for general overviews of traditional mixed mode studies see de Leeuw 2005 and De Leeuw et al. 2008). Blom, A.G., Bosnjak, M., Cornilleau, A., Cousteaux, A., Das, M., Douhou, S., & Krieger, U. (2015). 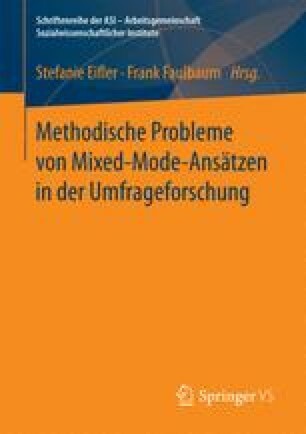 Comparison of Four Probability-Based Online and Mixed-Mode Panels in Europe. Social Science Computer Review 0894439315574825, first published on March 31, doi: 10.1177/0894439315574825. Eurostat (2009). Harmonized European time use surveys, Guidelines 2008. Methodologies and Working Papers. Luxembourg: Office for Official Publications of the European Communities. http://ec.europa.eu/eurostat/en/web/products-manuals-and-guidelines/-/KS-RA-08-014. Zugegriffen: 26. Juli 2016.